In Gimmicks and Patterns I wrote that new features either become table stakes, or are dismissed as being gimmicky. As some readers noted, this is a simplification of what happens. 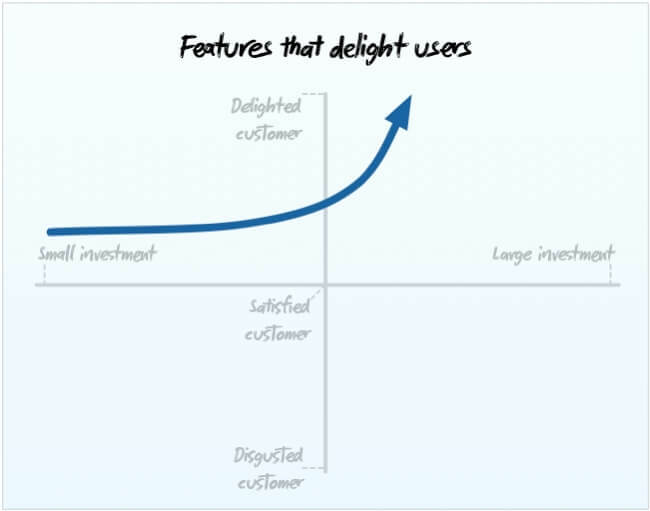 The Kano model shows exactly how the slide happens, and explains why any one particular feature or trait will never be a sustainable advantage. When new features emerge, even the smallest investment in them delights users as they are novel. Take “Location” for example. even a tiny investment, such as defaulting country and timezone correctly impresses users. As you invest further you really begin to delight them. No feature stays delights forever. Once everyone is using it, it quickly becomes a performance payoff. 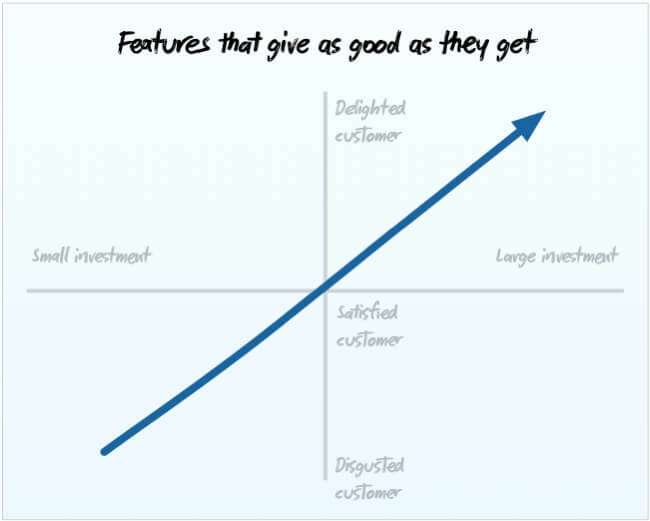 A performance payoff is a feature where, roughly speaking, the more you invest, the happier your customers are. 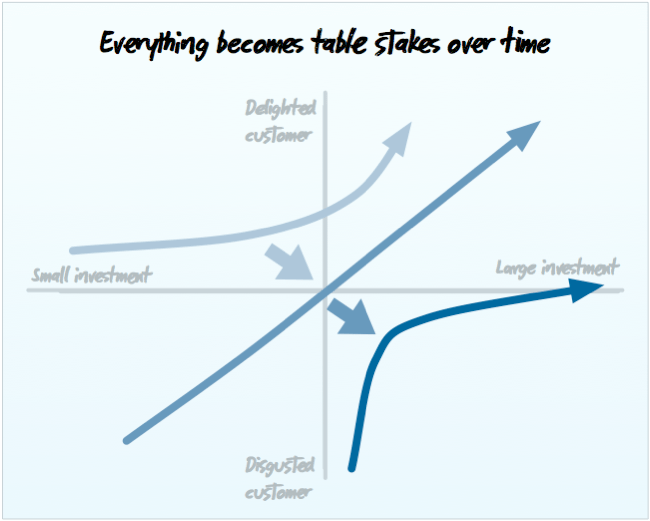 Most investments in user experience tend to fall into this category. A few years back UX was a delighter; it was easy to wow people just by laying out a web form correctly, and not putting a reset button beside submit. These days it is expected that websites are designed with the user in mind. A fast and easy-to-use web app that works in all modern browsers. Email notifications of events and parsing of replies. Mobile (either responsive or iOS/Android) app. It can take many months just to get the basics done. Until recently all of these features were individually delightful, and could themselves win over a customer, but now they’re all just table stakes. Worse still, if and when you’ve nailed these basics, you can’t just bolt on one killer feature to gain market share because no one feature will ever represent a sustainable advantage for your business. For consultancies this might be a part of the business that doesn’t make money, but also doesn’t lose any. For web apps this might mean a side project never realised, or shoddy features in the application. It all has to go.Everything you remove from a business enhances everything left behind. Keeping a whiteboard of products & services you’ll work on and finish “someday maybe” only serves to stop you having new fresh ideas. As Paul Graham noted, an obstacle upstream propagates downstream. I used to describe the above jigsaw to explain to potential clients why they might not be the right guys to build Facebook for Gamblers (or whatever). A web app has to be a good fit for the team & assets behind it, otherwise you’re not making the most of what you have, and you’ll inevitably come up against someone who is. The jigsaw visualisation doesn’t scale well for any reasonable size business however, as there are usually too many interconnected activities and resources to be shown. In “What is Strategy” Porter offers this diagram to explain the perfect fit that Southwest airlines has achieved. 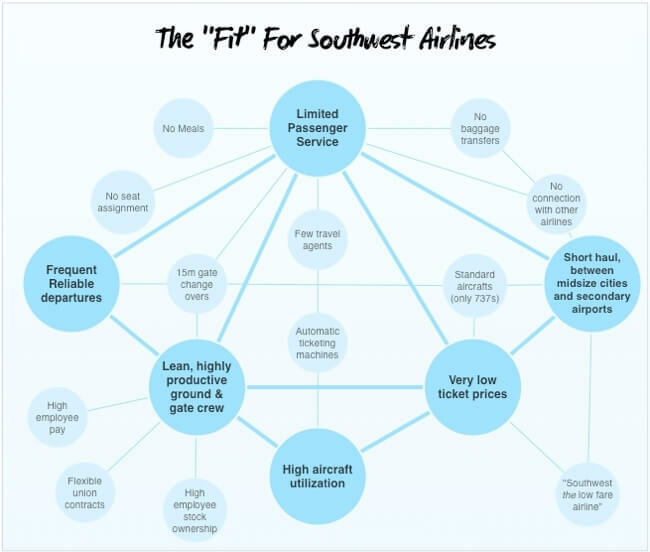 As you can see, the essence of Southwest’s strategy (low cost and reliable) comes directly from the things they don’t do (meals, seating, connections, baggage etc). This shows the importance of making trade-off and the value of saying no. 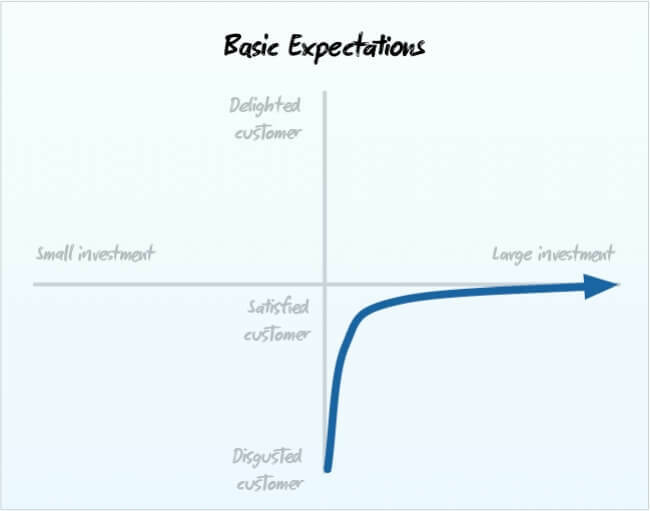 No one feature is enough to give you an edge, as the Kano model shows. As Porter writes, “Overall advantage or disadvantage results from all a company’s activities, not only a few”. One novelty feature might be enough to get a 99c iPhone app to the top of the charts, but a sustainable advantage is never based on one particular activity, but rather how all the activities fit together. Get that right, and you’re in business. What is Strategy – If you run a business, take half a day off, and read this seminal paper by Michael Porter. Your future self will thank you.